Use the menu on the right to navigate the different resource types we have on this page. We have produced a booklet in two versions - Malagasy and English to explain our research results (these are for viewing onscreen). We are producing a set of non-technical summaries of p4ges research papers. How effective are conservation investments in reducing deforestation and fires in Ankeniheny-Zahemena Corridor, Madagascar? Does Community Forest Management effectively slow deforestation and what is its impact on human well-being? Do REDD+ social safeguards reach the ‘right’ people? Who bears the costs of forest conservation? What is the cost of providing livelihood projects to local communities as part of REDD+ and forest conservation projects? Can Small-Scale Livelihood Projects Deliver Both Livelihood And Conservation Benefits? How does land use change in eastern Madagascar influence hydrology? This presentation was delivered at the close event of p4ges on January 27th 2017. Alex Rasoamanana presented this poster, 'Assessing input and output from swidden agriculture in a resource-poor-setting', at the EcoSumit conference in Montpellier (August 2016). Alex Rasoamanana of the p4ges team gave this presentation, 'Distributive equity in a protected area safeguard project in Madagascar' (ppt), at the Conference of the Parties of the Convention on Biological Diversity (Dec 2016 in Cancun, Mexico) as part of an IEED organised side event on conservation and equity. Some of the p4ges team recently organised a side event at the Conference of the Parties of the Convention on Biological Diversity (Dec 2016 in Cancun, Mexico). View the presentations given. 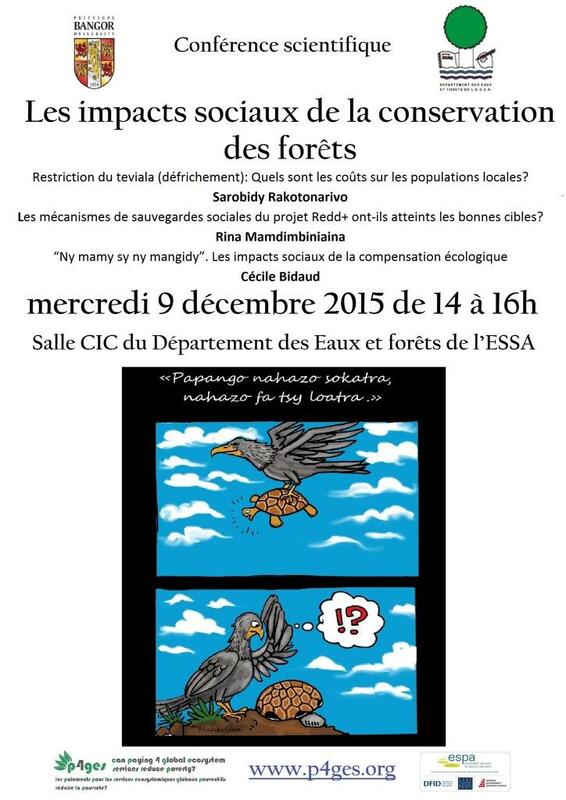 Presentations from the Conference on the Costs and Social Impacts of Forest Conservation in Madagascar. Presentation by Dr Alison Cameron. Presentation by Maafaka Ravelona on impacts of land uses change on hydrological ecosystem services. Poster presented by Herintsitohaina Razakamanarivo. Poster presented by Patrick Rafidimanantsoa. Conserving global benefits at local cost? Lessons from biodiversity offsets and a REDD+ pilot project in Madagascar. Presentation by Prof Julia Jones at International Congress of Conservation Biology, France, July 2015. Can REDD+ social safeguards reach the ‘right’ people? Poster presentation by Julia Jones Can REDD+ social safeguards reach the ‘right’ people? Presentation by Maafaka Ravelona about the hydrological team’s work given to regional stakeholders before a field visit at Mitsinjo, March 2015. Presentation by Bruno Ramamonjisoa and Julia Jones to World Bank team, Antananarivo, November 2014. A Malagasy-language local explanation of the p4ges project. Scenarios that were discussed as part of a research ethics training workshop for the p4ges team. Harvey, C. Rambeloson, A.M., Andrianjohaninarivo, T., Andriamaro, L., Rasolohery, A., Ramanahadray, S., Randrianarisoa, J., Christie, M., Siwicka, E., Remoundou, K., MacKinnonl J.L. (in press) Local perceptions of the livelihood and conservation outcomes of small-scale livelihood projects: a case study from Madagascar. Society and Natural Resources. Rakotonarivo, O.S. Jacobsen, J.B., Poudyal, M., Rasoamanana, A., Hockley, N. (2017) Estimating the welfare impacts of forest conservation when property right are contested. Land Use Policy. Razafindrakoto, M., Andriamananjara, A., Razafimbelo, T., Hewson, J., Andrisoa, R.H., Jones, J.P.G., van Meerveld, H.J.I., Cameron, A., Ranaivoson, N., Ramifehiarivo, N., Ramboatiana, N., Razafinarivo, R.N.T., Ramananantoandro, T., Rasolohery, A., Razafimanantsoa, M.P., Jourdan, C., Saint-André, L., Rajoelison, G., Razakamanarivo, R., (2017), Organic carbon stocks in all pools following land cover change in rainforest of Madagascar. In Soil Management and Climate Change: Effects on Organic Carbon, Nitrogen Dynamics and Greenhouse Gas Emissions. edited by Muñoz, A. and Zornoza R.
Tabor, K., Jones, K., Hewson, J., Rasolohery, A., Rambeloson, A., Andrianjoaninarivo, T., Harvey, C. Evaluating the effectiveness of conservation investments in reducing deforestation and fires in Ankeniheny-Zahemena Corridor, Madagascar. Read more. We are putting all our data online in public archives to ensure our data can be as widely used as possible. Much of our data is already public. Ramananantoandro, T.; Razafimahatratra, A. R.; Razafinarivo, R.; Rinaelintsoa, M.; Razakamanarivo, H. (2017). Wood specific gravity for trees in Ankeniheny Zahamena forest corridor, Madagascar. NERC Environmental Information Data Centre. https://doi.org/10.5285/5e9fe20b-8d00-4bd3-99cb-7989fa781348' in the references. Razakamanarivo, H.; Razafimbelo, T.; Andriamananjara, A.; Rianahary, A.; Razafindrakoto, M.; Harinirina, A. (2017). Soil profile and chemistry data in the Ankeniheny Zahamena forest corridor, Madagascar. NERC Environmental Information Data Centre. https://doi.org/10.5285/c3884aa0-b083-469d-8a0d-fdbbb79aff05' in the references.